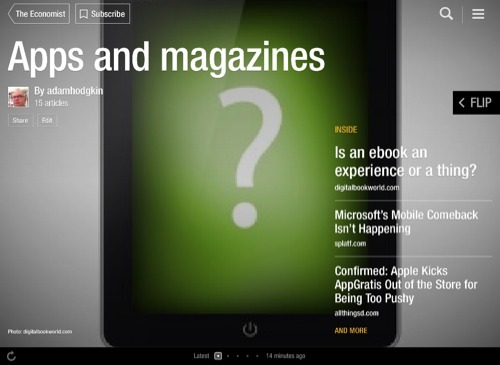 Exact Editions Blog | Flipboard a Threat to Digital Magazines? Flipboard a Threat to Digital Magazines? Flipboard is a very nice service, but it has too many challenges and opportunities to present a direct threat to digital magazines. Armstrong thinks that Flipboard is going to move into providing more content creation solutions for its users. This will certainly bring it more into competition with Facebook, Tumblr, Pinterest etc. Armstrong also thinks that it is practical that Flipboard could support paid for subscription magazines or feeds. This seems to me much less likely. If Flipboard starts doing this its going to face whole new set of challenges and obstacles (Amazon, Apple being two). Much more interesting for Flipboard is the opportunity it has to become the best tablet/iPad replacement for Google Reader, which has announced that it will commit seppuku in July. How Flipboard monetizes that position is a problem that they will enjoy addressing and its certainly going to involve advertising not paid for subscriptions. Flipboard has, from its inception, been a great tribute to the magazine industry. In their PR and their latest video, Flipboard continues to harp on the strengths of quality design and magazine layout. The magazine is their metaphor for the kind of content creation they encourage users to build. It will be interesting to see how magazine publishers and rights holders react to Flipboard’s new ways of user-based curation. Flipboard is doing a clever job of capturing content assets and customer attention, but its future battles will be with other social services. Paper.li has been pushing the idea of ‘making your own daily newspaper’, and they may be holed beneath the waterline by Flipboard’s magazine iceberg. Twitter, Tumblr and Pinterest will also keep a close eye on these developments, because Flipboard have shown a neat way of blending images, text and video. The smoothness and flexibility of the Flipboard content stream is also going to put a few questions beside the digital strategy that some magazine publishers have backed for their bespoke app development. Digital magazines that care about their audience and digital subscription revenues will be once more inclined to stay with the page-based, full on layout of the virtual periodical. There is much less point in budgeting $100,000 for a bespoke app solution that delivers a ‘reflowable’ magazine experience if it really looks no better than the default settings of a Flipboard content stream. The advantages of the page-based, and issue-based virtual magazine are particularly strong when it comes to holding an audience’s attention. Flipboard in its new shape atomises content as it fragments the audience – all this is good for an advertising model (suitable for Flipboard more than the original content producers). Not so much a winning strategy for the subscription generating digital magazine. The Flipboard magazines are dead easy to make. Drag and drop easy. Here is mine from this morning. Real magazines will know that their digital success will be anchored in building a community and delivering the best possible special interest content and visual stimulation to that group, through a periodical which is more like an authoritative review than a scrapbook of interesting snippets. Flipboard is not so much an iceberg but a clever cloud of midges. The Fanzine written by Supporters, for Supporters: Heroes & Villains. Now in Apple Newsstand. well, digital magazines are surely becoming popular day by day. while many companies are actually trying to create sound platforms to produce digital magazines, others are busy in providing help in creation of digital magazines to their customers whenever they need it. I created my own digital magazine using http://www.presspadapp.com. its pretty easy! i personally dont think that flipboard will be a threat to digital magazines.